CULLMAN – On Thursday afternoon, the 2018 Cullman County Fair opened with a ribbon cutting at the main gate, as a crowd of visitors waited their turn to get in. Too-hot-for-October weather encouraged the Cullman Lions Club and local dignitaries to keep the ceremony short, and folks were happy to get through the gate and on their way to the rides, games, exhibits and fair food. Fair President and Lion Charlie Childers welcomed visitors and, after the raising of the giant American flag at the gate, Lion volunteer James Williams cut the ribbon to get things rolling. 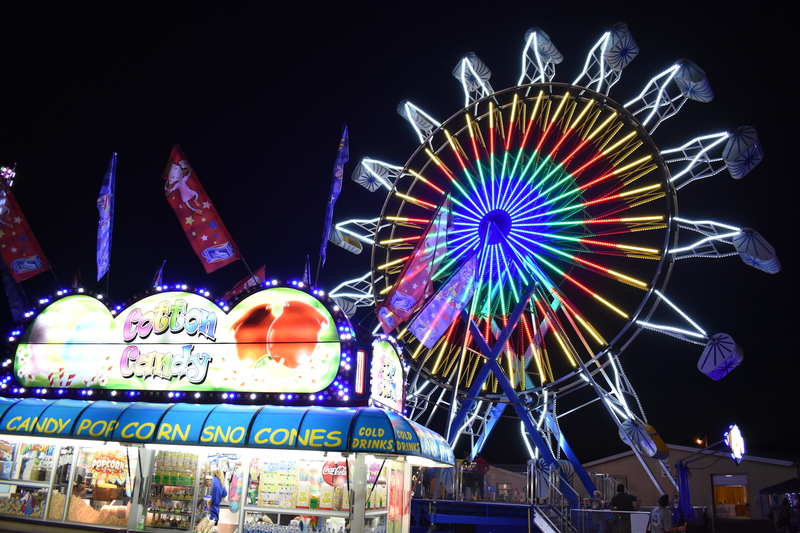 Several people noted that the layout of the fairgrounds under its new amusement company Kissel Entertainment seems well-organized, clean, and colorful. Childers shared, “Our new fair company is from Clanton, Alabama so they’re Alabama folks, and we’re proud to have them. I visited them last year, and it has got to be one of the cleanest, nicest carnivals you’ll ever go to. Beautiful rides; they’ve got a couple of huge, big rides that anybody ought to have a challenge to be on and keep their lunch. And they’ve got a great hospitality tent set up, so when it is really hot, you can sit under it and get a little cool shade. And you’re just going to be really surprised. The Kissel website states that each ride is inspected daily, and that safety is a top priority. Kissel requires all employees to pass drug screening and background checks. For more information on Kissel Entertainment, visit http://kisselentertainment.com. Parents of young children will be happy that Kissel also has an entire selection of rides and fun for the little ones. New high-flying rides like Alter Ego, a 120-foot tall thriller that takes riders to the top of a giant spinner and flips them! And of course, the new Alabama state-record watermelon. It’s huge! For a full fair calendar, visit www.cullmanfair.com/calendar. For a full photo gallery of Thursday’s opening night, visit www.Facebook.com/CullmanTribune.